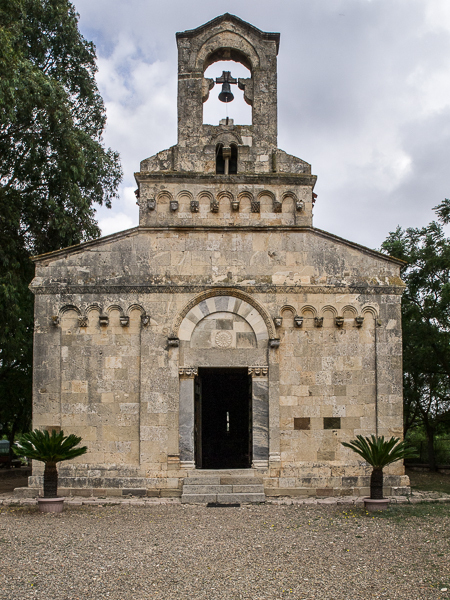 The St. Mary’s of Monserràto church (Santa Maria di Monserràto in Italian), dates from the second half of the 12th century, probably built by master builders from Tuscany and it is located in the surrounding of the sprawling farm town of Uta. During the 19th century, the building was included to the new municipal cemetery, of which this church became a chapel. Until 1800 there were the ruins of the monastery, with a now destroyed cloister and a still existing well, with miraculous waters. The excavations carried out inside the building led to the discovery of an older church, smaller than the current one. In the central area of the facade, there is the portal surmounted by a decorated arch. On the top, there is a window divided into two parts by a column, a bell gable and several decorative arches. In each flank there are windows and doors. According to Canon Giovanni Spàno’s testimony, the northern door is called “the holy door ” because it was opened only during the Jubilee Years. In the back of the church, the semi-circular wall of the apse has a small window. On the left, an interesting eight-pointed cross is engraved in the protruding pillar, probably referred to the Order of Malta or to the Templar Order. The ornamental arches are supported by figures of humans, animals and plants. The interior of the church is divided into three parts by four columns on each side. Some elements of the columns have probably Roman origin. The capitals, all of the Middle Ages, have a vegetal decoration. The roof covering is entirely made of wood. Under the high altar there are two lions, previously placed in the upper part of the facade. The church is situated at about 2 km far from the centre of the village of Uta. When arrived in Uta, go through Via Stazione in south-east direction. Proceed along Via Roma, go beyond Piazza Garibaldi and after 130 m (426 ft) turn left into Via Santa Giusta. Go straight on in Via Santa Giusta until a square with the same same and then turn right. Then turn left and left again into Via sant’Ambrogio. After about 90 m (295 ft) turn right into Via Santa Maria and the church is far only 500 m (1640 ft) and has a big space to park cars. A footbridge is on the right side.